Nostradamus, the 16th century French sage, doesn’t get the credit he deserves for his recipe for the Black Plague. He recommended swift removal of infected corpses; fresh air; clean water; and drinking copious amounts of Vitamin C in rose-hip tea. He was also against the then customary practice of bleeding patients. The beak in his outfit was filled with aromatic herbs for staunching the putrid air. 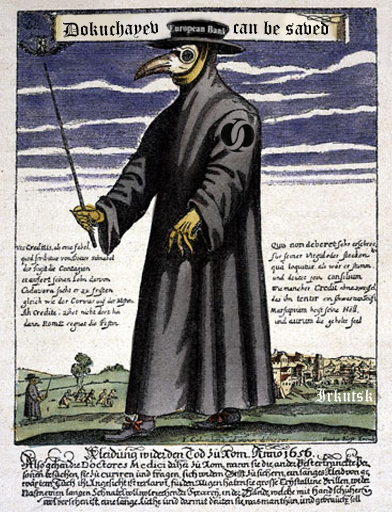 But the mortality rate among plague doctors was high; most survived by running away from their patients. To keep them on the job, municipalities used to offer them four times the going rate for conventional doctors. The European Bank for Reconstruction and Development (EBRD) likes to think of itself as Nostradamus. It was set up in 1991 by the states which believed they had won the Bubonic, I mean Cold War against the Soviet Union, to provide the promise of cheap credits to the states they had defeated; as well as money to elements in Russia who could be counted on not to backslide into statism. That makes for what the EBRD counts as 85% of its €13 billion Russian loan book in the private sector. A lot of aromatic snorting has followed through the EBRD’s beak. According to the bank’s annual report for the year 2000, “the EBRD helps its 27 countries of operations to implement structural and sectoral economic reforms, promoting competition, privatisation and entrepreneurship.” Note the loaded term in every banker’s vocabulary – help. After 20 years there’s still no certainty that the patients whom the bank has claimed to revive, after pocketing its sizeable reward, would not have done so at a cheaper cost, without any EBRD intervention at all. The only certainty in the EBRD’s financial record is that it has booked one to two billion Euros on its profit line in 2005, 2006, 2007, and 2010. The loss-making years have been those in 1998, 2008 and 2009 when Russian, regional, and global share markets all suffered sharp downturns. So when the EBRD calculates how best to turn a profit, it aims at making much higher returns on its share-buying or equity investments than it can squeeze out of its loan book; and lending as conservatively as possible to mitigate the risk of default and loan loss. Nowadays, and in the time of Nostradamus too, the real name for that is self-help. The big wager the EBRD strategy plays for its profit line is on share price increase – and that has little or nothing to do with the criteria EBRD transaction announcements claim to be driving its deals. To gauge the EBRD’s performance according to its own buzz terms – reform, competition, privatization, entrepreneurship, transparency, governance — consider the Russian record. The EBRD has invested in Russian state-controlled transport companies like Transcontainer, when Russian Railways wanted to establish the marketability of Transcontainer shares without tolerating genuine privatization. The bank has loaned $100 million to Sergei Generalov, the Russian transportation oligarch least likely to succeed, to transform his Far Eastern Shipping Company (Fesco) into a rail and container carrier. Half that sum, $50 million, is being considered for award, but not yet signed by the Russian banana importer, Joint Fruit Company, after Vladimir Kekhman, its owner, had leveraged or lost most of his pre-2008 profits. The money is planned to go into the environmentally doubtful process of gas chambers for accelerated ripening of bananas. The EBRD’s biggest contribution to the Russian media sector has been to help cover Rupert Murdoch for the debts of his News Outdoor advertising business. There have also been mystery investments in Russia, such as the unexplained and inexplicable $30 million (subsequently reduced to $21 million) given to cobalt prospector Imperial Mining at Gosh-Agach, in the Altai region. And as naturally as fleas infect rats, which infect human beings, there has been corruption and misjudgement. Not that the EBRD ever owns up to either. After investigating Oleg Deripaska for months in 2005, the EBRD got him to sign undertakings on ownership of Rusal which have turned out to be false or misleading. Exactly which has already been ruled by four of the most senior judges in London, and will be decided in the UK High Court in a few months’ time, when Cherney v Deripaska comes to trial. This is a long preamble to asking why the EBRD announced last week that it has paid Rb1.53 billion ($51 million) for a 5.26% stake in the junior Russian goldminer, GV Gold. The initials GV stand for Golovets Vysochaishy, which in turn refers to gold-rich hill country around Bodaibo, northeast of Irkutsk; in Russian the name means bare-top mountain. The latest transaction values GV Gold at $911 million. Here’s the EBRD announcement. And here’s what GV Gold has to say about the same transaction. The deal is unusual for several reasons. EBRD avoids naming him, but the principal owner of GV Gold is Sergei Dokuchayev, who with two brothers, his daughter and other family members controls the company, as he and they also control Lanta Bank, a small Moscow-based institution specializing in gold transactions. Four times since the late 1990s, Dokuchayev has tried to sell his mining shares on a public exchange – once in Toronto, at least two times in London, with a partial effort in Hong Kong recently. He has failed on every occasion. Accordingly, Dokuchayev has the distinction of proving that whatever business he is running at GV Gold, and however successfully he claims to be doing it, no public shareholder except BlackRock has been willing to run the risk of buying his shares – and then only in private placements concealing the real share price and the asset valuation. 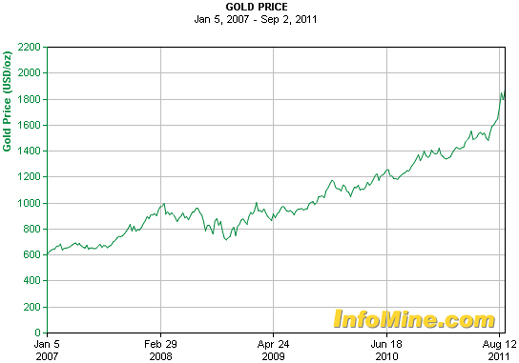 By early 2010, BlackRock had bought more GV Gold shares at an unknown price and accumulated a stake of 19.99%. The latest GV Gold annual report for 2010 – finalized in March of 2011 — reports that BlackRock is a stakeholder, but omits to quantify the size of the stake. Dokuchayev’s personal stake is reported as 22.19%, and equal sized stakes are reported as in the hands of two other board directors – Natalia Opaleva and Valerian Tikhonov. A front company called Brishurt Ltd is also identified as a stakeholder, but who controls it is not disclosed. Uncorroborated reports indicate its stake amounts to 6.72%. Almost every major goldminer in the world has taken a close look at GV Gold’s assets. 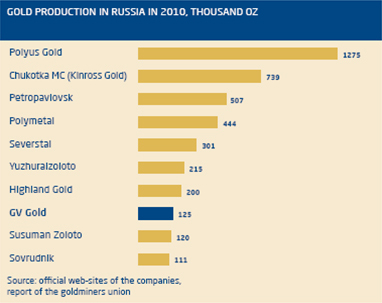 That’s because the principal production site near Bodaibo used to be part of the much larger mining licence for the famous Sukhoi Log deposit; with at least 33 million ounces estimated below ground, Sukhoi Log is the largest unmined gold deposit in Russia, and one of the largest in the world. That target has attracted a great deal of dirty business – and I’m not talking about the kind miners use their shovels for. The story of how the Dokuchayev family, in league with a local mining group called Lenzoloto, happened on Golets Vysochaishy has been told here. The Lenzoloto story still wags its tail on the GV Gold board, where the former chief executive of Lenzoloto, Vladimir Kochetkov, is reported to hold a 5.76% individual shareholding. Kochetkov’s biography on the GV Gold website omits his association with Lenzoloto. What is left of Lenzoloto’s much larger stake – indirectly controlled by Polyus Gold, which took over Lenzoloto in 2004 — may be lodged under the Brishurt Ltd. name. If so, EBRD may have stubbed a due diligence toe on a rock that noone has wanted to turn over. As for discovering for what kind of partner GV Gold is, EBRD is very much a Johnny-Come-Lately. According to documents prepared for Lenzoloto in October 1998, and leaked eight weeks later, Goldfields of South Africa, was just one of the international goldminers approached to develop the area’s gold deposits at that time, including Vysochaishy. JCI of South Africa had beaten Goldfields to the site, but no project eventuated. The two Canadian gold miners, Barrick Gold and Placer Dome, were also active in pursuit of the deposits. Placer Dome subsequently abandoned all Russian interests, while Barrick went on to acquire minority stakes in Celtic Resources and Highland Gold. No established Russian gold mining group has shown a buying interest in GV Gold to date, despite signs apparent before the 2008 bust that the state-owned conglomerate Russian Technologies, run by Sergei Chemezov, wanted to branch out of titanium and magnesium mining into gold. EBRD’s archive shows that in the mid-1990s it loaned small sums to the Kubaka gold project, ill-fated but profitable nonetheless for its Canadian operator, Kinross; and to Buryatzoloto, which has over the years become the property of High River Gold, a Canadian-listed goldminer now owned by Alexei Mordashov. It was a key asset in his failed attempt to sell shares in the London initial public offering market this past February. If there is a lesson in this 20-year history, it is as BlackRock judged – never pay a premium for a Russian gold asset if you can help it. The problem for the international miners, and then for institutional investors and market regulators in Toronto and London, has been the special family character of the GV Gold and Lanta business; and doubt that it will make a serious contender for the Sukhoi Log licence, when the Kremlin decides, after 13 years of calculated delay, to award it. In 2007, when the gold price was rising steadily, this scepticism helped trigger a dramatic risk discount in the estimated valuation of GV Gold – from a target of $800 million in February of that year to $420 million in May, and then $167 million in November. So why did the EBRD announcement refer to BlackRock as an investor – the GV Gold announcement omits this disclosure — when BlackRock has never publicly discussed its operation with GV Gold shares, the pricing of those shares, or its valuation of the company? This is a reference to the rising gold price, but what else has changed for GV Gold’s ownership, governance, and risk profile? EBRD “will never comment on how it arrives at evaluations,” responds Wallis. 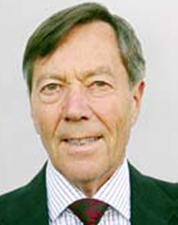 Perhaps the independent director on the GV Gold board, Reinhard Schmoelz, may have played a role. He was for many years a member of the EBRD staff. The record suggests that he had also tried to interest another former employer, Credit Suisse, in underwriting an earlier GV Gold share sale. Would the EBRD clarifty Schmoelz’s role in the share sale and purchase negotiations, and does EBRD know whether Schmoelz may have received a success bonus from the deal? GV Gold’s spokesman, Tatiana Demyanova, replies that “the size of such payments is decided at the board meeting, so we will have to wait for it to find out.” According to the GV Gold report for 2010, directors were paid for that year $5,000 per calendar month, plus up to $50,000 for their expenses over the year — $110,000 per director. Demyanova was asked to clarify the outcome of the recent share placement; in particular, whether GV Gold acknowledges that the EBRD was the only buyer of the shares on offer. If EBRD says its transparebncy and accountability code never allows it to disclose such deal details as would enable outside analysts to understand what it is doing, what exactly is the code it has required GV Gold and the Dokuchayev family to adopt? Their lack of transparency, and the relationship between GV Gold with Lanta Bank, have apparently added to the risk discount , so for EBRD to pay more than five times what BlackRock has valued GV Gold to be worth ought to have been based on more financial disclosure than GV Gold has provided to the open markets to date. Noone would think ill of BlackRock, certainly not its investors and stakeholders, if it bought and sold goldmining equities as part of a broader strategy of betting on, also hedging against, the movement of the international gold price. BlackRock certainly doesn’t have to announce that its business is to HELP those whose shares it buys or sells. HELP, however, is what the EBRD claims to be doing, when in fact it may be doing something much more profitable — like speculating on the link between the price of gold and an unlisted Russian goldminer’s share price. So let’s see how in the days which have followed the announcement of the EBRD purchase of GV Gold shares, GV Gold performs on the transparency and governance criteria Wallis claims the EBRD has now set for the company. The GV Gold website is relatively under-informative, compared to its publicly listed Russian peers, and the annual report provides only selected financial data a year in arrears. So spokesman Demyanova was asked to say by how much the Dokuchayev family stake and BlackRock’s shareholding in the company have been diluted by the sale of new shares to the EBRD? “After the additional issue,” she says, “the participation decreased in equal proportion, and BlackRock’s stake has diminished from 19,99% to slightly below 19%.” Score that answer NEGATIVE for disclosing the post-transaction control stake of the Dokuchayev family.